Decorative Hardware Company Adds New Bath Accessory Products to its Extensive Whittington Collection. These new lines of bathroom accessories are made of solid brass and feature sleek and stylish, space-saving designs. Signature Hardware is expanding its Whittington Collection bathroom accessories offerings with shower baskets, swing-arm towel bars and more in five new collections: Albury, Ceeley, Ballard, Engel and Farber. These new lines are made of solid brass for durability in a bathroom environment and feature sleek and stylish space-saving designs. Homeowners can keep bathroom floors dry and clear of clutter with single or double towel bars, towel racks and single and double robe hooks. Towel bars with swing arms easily rotate to provide ample room for multiple towels and robes or can be placed flush with the wall when not in use. The towel racks are available in traditional styles with an upper shelf for folded towels and a lower bar for hanging hand towels. For more space-saving ideas, the Solid Brass Folding Towel Racks feature a shelf that can be pulled down when needed or folded up to the wall when empty. 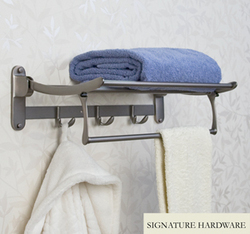 The folding towel racks include three sets of double hooks and can be purchased with or without a towel bar. This versatile accessory is ideal for creating storage space in bathrooms, hallways, laundry rooms and more. Multiple robe hooks in a bathroom allow room for all household members to hang their robes and towels. Keeping the toilet area of the bathroom tidy is simple with stylish toilet brush holders and toilet paper holders. The wall-mounted accessories discreetly store supplies off the floor while keeping them close at hand. The toilet brush holders include frosted glass containers to conceal cleaning supplies. The toilet roll holders feature an open-arm, European design for easy refills. Storing toiletries on wall-mount bath accessories, including tempered glass shelves, soap dishes, lotion dispensers and shower baskets, maintains a safe and organized environment. The new single or multi-tiered shelves feature a modern look with sleek lines, while the tempered glass provides an extra measure of bathroom safety. Tempered glass is the ideal choice for bathroom items because of its ability to withstand high temperatures, and if broken, it will shatter into small, cube-shaped fragments instead of large, jagged shards, significantly decreasing the risk of injury. Wall-mount soap holders, lotion dispensers and shower baskets offer an easy way to always have the necessities within reach. The shower baskets come in many design styles, including corner baskets, to maximize space while keeping an elegant look in any bathroom. These bathroom accessories are offered in a variety of premium finishes, including Chrome, Polished Brass, Brushed Nickel and Oil Rubbed Bronze. 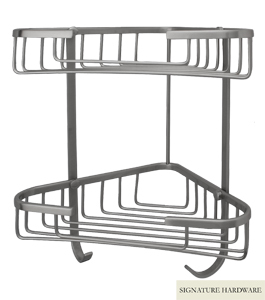 Prices range from $6.95 for the robe hooks to $99.95 for the multi-functional towel racks. The combination of quality materials and finishes result in lavatory items that will enhance existing décor. These items and more can be seen online at the company’s website, http://www.signaturehardware.com, or in the company's full color catalog. Customers are invited to order a free catalog by calling customer service toll free at 1-866-855-2284. Signature Hardware is a direct merchant of antique-style reproduction fixtures for the home. Working directly with the factory and selling direct to the end consumer, they are able to provide superior service and exceptional value. The firm distributes its products nationwide, and sells direct to the consumer by the use of print catalogs, their retail showroom located in the Cincinnati area, and over the web.